Only 1000 numbered, Limited Edition copies of Joe Yee and his Lures will be printed. A person is fortunate to meet anyone at the top of their chosen field. 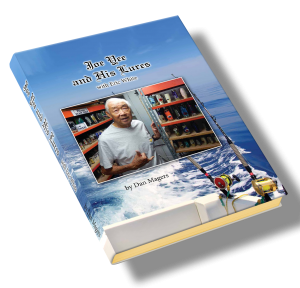 But for a marlin fisherman and saltwater trolling lure junky to have that opportunity with Joe Yee himself is beyond luck; it is a privilege. Joe Yee and Eric White have been friends for decades. Over the course of numerous trips to Honolulu between us, Eric and I spent virtually every waking moment with Joe for days. The time spent in Joe’s shop going through his processes, philosophies, successes and failures was an amazing experience. In Joe Yee and His Lures, Joe talks about his past, surfing and fishing with his good friend Duke (as in Kahanamoku,) popular lures he made, and anything else that came to his mind. 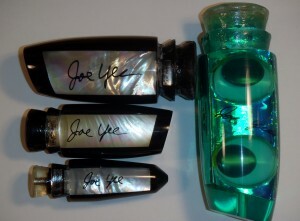 A double plunger with 4 eyes, signed on the interior by Joe Yee, along with a collection of lures showing Joe’s signature on shell. Joe insisted this book be “The Encyclopedia.” Therefore the middle of the book, pages 32 to 114, include every style of lure Joe made commercially. These pages contain lure descriptions, anecdotes about the way many of the lures’ names were derived, skirted lure photos, and even actual size, length-annotated head-only photographs of each Yee lure head style, for easy identification. In many categories Joe had a story or comment to include. This part of the book also debunks many widely held myths that “Joe never did this” or “Joe always did that.” You will find that Joe did what Joe wanted to do, and either sold those unique pieces to a few people he liked or gave them to friends. He only printed one ‘catalog’ in 55 years of lure making, and a full copy of that catalog is in the Appendix. When first approached about the idea of doing a book about him, Joe’s typical modest reaction was, “That’s fine with me, but nobody will buy it.” It’s quite a project to research decades of craftsmanship and confirm the findings through the maker when you are working with a modest personality like Joe’s. Presenting it accurately and as unfiltered as possible is another challenge. Throughout this process Joe insisted this book be about his lures, not himself. Inside Joe Yee and His Lures you will find both. And you should know that this book was done with the permission and cooperation of Joe Yee, and that Joe is a major partner in the distribution of any proceeds from this book … whether he likes it or not. Only 1000 limited edition, numbered copies are being printed. Joe Yee and His Lures is a “coffee table style” large 9 ¼” X 12 ¼” glossy, full-color, hardcover, case-bound book. More than 400 full-color photographs are printed on glossy art-quality paper with gold gilt edges. It deserved no less. Please watch for the book to appear in our store right here on the website in late June. I hope you enjoy this book half as much as I enjoyed putting it together. 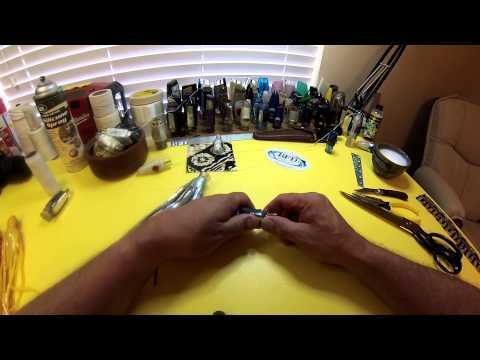 This entry was posted in Joe Yee Lures. Bookmark the permalink.